What will increase my risk of fungal nail infections? How are fungal nail infections usually treated? How has Nail-Rx helped others? How do I use Nail-Rx? Fungal infections of the finger and toenails are very common and notoriously difficult to get rid of. Fungi are everywhere in our environment and can infect various parts of the body with different effects. When the nails become infected with a fungus they begin to look thickened and discolored. As the infection progresses and invades more of the nail, flaking, peeling and crumbling may occur. In some instances the nail comes smoothly away from the underlying nail bed as a result of the fungal growth. These nails will not only look unsightly, but also have a tendency to smell unpleasant as the fungus grows and invades the tissue. Our nails are naturally built to be strong barriers, and resistant to fungi and other infections. However, because of how strong this barrier is, once nail fungus is present, it is sometimes very difficult to eliminate the infection. Fungi love warm and moist environments to grow in. Tight footwear especially when used for exercising, provides an ideal breeding ground for fungi. Communal showers are another place that fungi are commonly growing and being passed between various people’s feet and toenails. Any reason for reduced immune functioning will predispose an individual to fungal infections. Diseases like diabetes and AIDS as well as lifestyle factors like exposure to pollution, lack of exercise and an unbalanced diet all hinder healthy immune functioning. Conventional treatment of fungal nail infections is expensive and long-term. Treatment may include topical preparations and/or oral anti-fungal medications. Nail fungus can be very stubborn to treat and people whose infection clears up often find that it returns soon after discontinuing the medication. Oral antifungals all have significant side-effects and interact with many other medications. Following a healthy nail care routine can go a long way to maintaining nail health. Firstly, a balanced diet will help to keep nails growing strong and healthy. Secondly, make sure that your nails have space to ‘breathe’ and do not become damp for long periods of time. Fungi love warm and moist environments to grow in. Tight footwear, especially when used for exercising, provides an ideal breeding ground for fungi, which can affect the nails. Communal showers are another place that fungi are commonly growing and being passed between various people’s feet and toenails. Any reason for reduced immune functioning will also predispose an individual to fungal infections of the nails, so efforts to support a healthy immune system will also help to maintain the health of your nails and nail beds. Natural remedies have a wide range of applications for overall health, and can also be very effective in supporting the health of the nails. Our finger and toenails can be our pride and joy – or a source of deep embarrassment! We rely on our nails for many things – to protect the tips of our fingers and toes, to grip objects firmly and even to protect ourselves in times of danger. But mostly we focus on the appearance of our nails. Whether you want long, elegant fashionable nails, or short, functional ones, nails are difficult to hide away when they are not looking their best! It stands to reason that it is important to support nail health to prevent common flaking, thickening and discoloration. In fact, nail condition is a good reflection of our overall health. 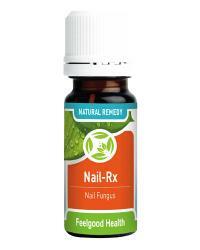 Nail-Rx is a 100% safe and effective natural remedy for treating fungal infections of the nails. Combining 100% essential oils extracted from plants, Nail-Rx is highly concentrated and has strong anti-fungal properties. Melaleuca laterifolia is also known as Tea Tree Oil and is used externally for inflammation and to treat various skin conditions. This oil has excellent anti-bacterial, anti-fungal and healing properties. Tea Tree Oil will soothe and reduce inflammation of the skin and nail as well as treat any fungal infections. Lavendula officinalis (Lavender) is a sweet-smelling essential oil with antifungal, antiviral and antibacterial properties. This oil also has balancing and soothing properties. Cymbopogon citrates (Lemon Grass) is known to treat infections and is especially helpful for fungal infections. This anti-fungal and anti-bacterial oil is also soothing and assists healing by promoting cell regeneration. Syzygium aromaticum (Clove oil) is considered an excellent antifungal and antibiotic essential oil. Clove oil is a well-known antibiotic and will improve the health of your nails. Directions: Using a clean cotton bud, apply directly onto affected area two to three times daily. Use together with Candidate Drops for maximum benefit and to treat particularly stubborn cases of recurring nail fungal infections. Treatment with Candidate Drops is especially recommended if you are having problems with yeast and fungal infections like thrush, jock itch or candida. Caution: For external use only. Please consult your medical practitioner should symptoms persist. With regular use the infection should begin to clear within 3 weeks of use. Over the following weeks and months new, healthy nail growth will begin to appear. Remember that fungal infections damage the nail itself and that this damage will have to 'grow out', even though the infection itself has been cleared. My toenails hurt when I run- could this be a fungal infection? Fungal infections of nails can cause varied symptoms including pain in the nails that is worse during athletic activity as well as changes in the shape, color, smell and texture of the nail. Other conditions may also be to blame so if you are unsure it is best to consult your health care provider. I have a fungal infection on one of my fingernails and have been using artificial acrylic nails recently. Could the artificial nails be to blame? Yes - sometimes a small gap develops between the artificial nail and your own nail providing a small, warm and moist space for fungi to grow. For this reason it is important to have artificial nails applied and maintained by a professional nail technician or, even better, avoid artificial nails altogether. Keep nails trimmed but not too short. If you cut your nails too short you may cause small cuts and tears which allow fungus to penetrate the nail bed. Do not use sharp or pointed instruments to clean your nails. Again, these may cause injury to the surrounding area, allowing fungi access to the nail. Keep your feet as clean and dry as possible, changing shoes and socks regularly. Treat athlete’s foot quickly and aggressively as this fungus can spread to the toenails. If you are prone to fungal infections (including athlete's foot, 'jock itch', thrush and nail infections), reduce the intake of sugar and refined carbohydrates in your diet. Use Feelgood Health Candidate Drops to control fungal infections and candida growth.